Well dear friends we have just spent 4 days in Prague... or as the locals call it Praha. One of those days we took a day trip to Kutna Hora a small town about 70 Kms south of Prague... but that trip is worthy of a separate blog. We are all tuckered out from all the walking and getting concerned that the voltaren and nurofen will run out before trips end. Prague's streets are paved with rough hewn stones which for old feet like ours makes for tough ambulation. Regardless of that, I have to say that this city is quite something. 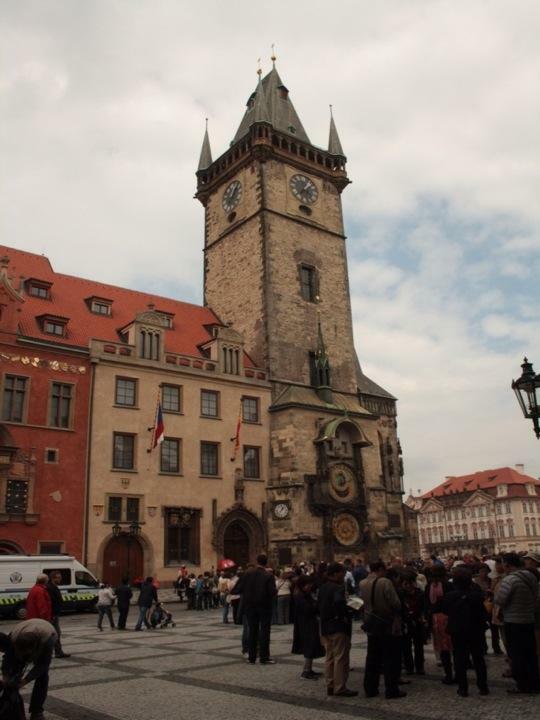 It's a medieval city with a mixture of spectacular gothic, baroque and art nouveau architecture. While it was neglected during the recent communist period, thankfully they didn't destroy it. around. Being lunch time, I couldn't go past the czech sausage called klobása along with some hot potato and cabbage (mixed together... an interesting combination)...and a local pilsner. Well I can take a lot of things, but this was the fattiest looking snag you have ever seen. I'm glad I took my statin medication earlier in the day. I have added a close up photo of that bad boy for you to all enjoy.... And yes that white bit is I believe a large lump of pork fat! That piggy wig, stuffed most likely into its own intestines, played up with me for at least the next 36 hours. On day 2 we visited the museum of Communism. Apparently after the end of communism in 1989, a lot of the statues, posters and propaganda material were taken down and destroyed as people just didn't want any memories of the old regime. Some was saved from the furnace and placed in this museum to provide the history and describe what it was like living in Czechoslovakia under communist rule. Apart from reading panels and looking at photos that recount the communist history, there were some amusing propaganda posters. There were a number of busts and statues of Lenon, Stalin Karl Marx and other prominent Communist that were probably taken from parks, government buildings and street corners following the fall of the regime. Our next visit was to the Alphonse Mucha museum which was quite a small affair displaying a number of his original pieces. For Art Nouveau lovers this is a place worthy of an hours visit. For those who don't know who Mucha is, I can guarantee you would know his work. Even a complete Philistine like me recognised some of his posters and designs. Mucha is best known for his commercial artwork, particularly posters advertising theatre and other events in the early part of the 1900's. Day 2 ended following a visit to Prague Castle...or as the locals call it the Hrad. Apparently it is one of the largest castle complex in the world. On the grounds is the magnificent gothic Cathedral of St Vitus. Although as one older Canadian tourist told us later "if you've seen one Cathedral you have seen them all". On our way back to our apartment we walked over Charles Bridge. This is very ornate bridge lined on both sides with religious statues and revered leaders from the past. It is now closed to vehicular traffic so has small stalls with locals flogging souvenirs or trying to paint your caricature. Given I don't have any real prominent facial features, I thought I wouldn't be a good subject for this sort of art. Of course the bridge has its fair share of beggars as well. Day three was sort of a rest day... or so we thought. While we didnt get going until 11.30am, we still would have walked over 6 Kms. We took a quick visit to the Lennon wall (that is the Beatle John Lennon not the father of the Russian revolution). This wall came about when someone painted a picture of Lennon following his shooting in New York in 1980. The Communist authorities painted over the graffiti and that started a series of John Lennon pictures and his song lyrics being painted up on the wall. It soon became a focus for activists seeking an end to Communism as they saw John Lennon as someone who spoke and wrote songs about love and world peace. Eventually the authorities gave up painting over the graffiti. While people now just use the wall as a place they can legally graffiti, it still mostly has a John Lennon theme running through the pictures and statements placed there. We also visited a garden know as the Valdstejnska Zahrada (or garden, ). iI's sort of hidden and not easily found unless you are particularly searching for it. The previous day when we were looking over the city from the castle walls we saw a large black rock wall that was difficult to make out all its features. A bit of googling later that evening said it was a modernist piece of art work set within garden. Up close this wall known as the grotto is probably 40 - 50 metres long and 30 metres high and has been fabricated from rocks and concrete into. In amongst the dripstones there are grotesque creatures, frogs and snakes. Now for some general observations and final comments on our time in Prague. Since we have been in Europe beggars have been in most tourist spots, and the Old Town Square and other tourist spots were no exception. The biggest difference was that there were a number of people openly going through the bins picking out the half eaten bread and bits of sausage and meat thrown out by others and placing it in old plastic shopping bags. There are always lots of people in these places, so there are lots of fresh food scraps. While you know scavenging in bins happens, It's still rather confronting when you see it first hand right in front of you. Everyone around were just matter of fact about what was happening. The beggars were never aggressive toward us. On one occasion a couple of older guys were waiting by the self serve ticket machines where we bought our tram and Metro tickets. I suppose it was a good place to see if people would give them their loose change. While you may say no to them, they wouldn't move, standing less than a metre from you in the hope you would change your mind. It is a sad side of any big city where there is poverty, along with drug and alcohol abuse I suppose. On a lighter note, here is a tip for those contemplating a trip to the Czech Republic. You'd better like pork in all its forms. The cafes and restaurants around Prague have a predominance of pork on the menus, particularly if you want to eat local dishes. While they do offer other varieties of dead animal, it is usually just an unimaginative single steak or chicken dish that doesn't really appeal. Jane in particular has a thing about eating pork as she read somewhere that the internal anatomy of the swine is similar to a human and so while not Jewish or Muslim, does ascribe to the view that the pig is not kosher. So if you don't like pork, be prepared for less choice. The other observation is that traditional fare has a total absence of vegetables other than potatoes and cabbage. In fact, one dish Jane ordered didn't even have those. It was a goulash of some description and all it had was slices of bread dumplings to soak up the gravy. One particular and seemingly popular dish was the pigs knuckle...and others referred to it as a pigs knee on their menus. I suppose it's the pig equivalent of the lamb shank. The intriguing thing about this dish was the manner in which it was served. This huge thing comes out secured vertically in a special clamp like contraption. The idea being that it allows the eater to slice pieces off the knuckle, confident that this porcine monstrosity won't be catapulted off the plate. To my mind while it looked huge, there were a lot of fatty and chewy bits and leathery pig skin you had to navigate in order to get to any real meat. At the end you were left with a large swines lower leg with just a bit less meat and connective tissue on it then when you started. I am told that in Hungary where we are heading next, it wont get any better. a few trip advisor web sites say that pork is the main thing on the menu and even the vegetarian dishes are cooked in lard. So it would appear the pig gets more nervous the further East you go in Europe!